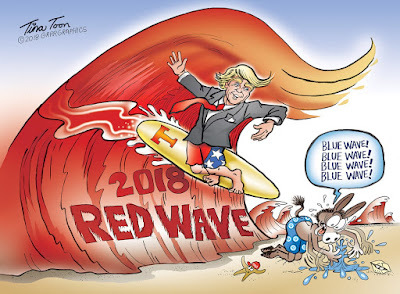 In Santa Cruz, California, where I hang out, I doubt there are many who think that a "Big Red Wave" is going to be coming ashore in November. I am talking politics here, of course. That "Big Red Wave" terminology refers to the possibility that Republicans could win lots of Congressional elections throughout the country this year. As I say, I doubt many of my friends and acquaintances think that's very likely. In fact, my bet is that most of the people I encounter in my daily life are expecting a "Big Blue Wave," not a "Big Red Wave." Could we all be wrong? Christopher Buskirk, writing in The New York Times, posits a series of Republican electoral victories as a real possibility. His article is titled, "If There’s a Red Wave Election in 2018, This Will Be Why." 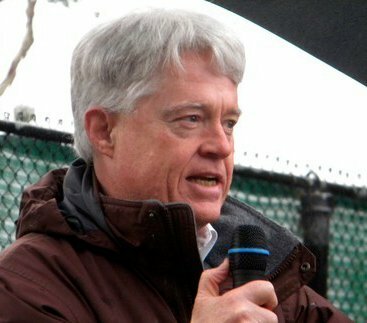 Buskirk is the publisher and editor of American Greatness, which advertises itself as a voice of conservative independents. So, consider the source. Consider the argument, too, however! I think it would be worthwhile for all those interested in a "non-conservative" politics to hear what Buskirk has to say. Basically, he says that the American public actually knows that our democratic politics should be about "we," not "me," and that while our current, "transgressive" president is definitely in the "me" camp, in his personal conduct, he is quite proficient in articulating the "we" theme in a way that appeals to many. Giving up on a failed policy of moral imperialism allows Republicans to focus on forming good citizens and restoring a sense of Americanism that relies upon strong ties of fellowship and belief in a shared destiny. To that end, our candidates would be well advised to ignore strategists and consultants who talk exclusively in terms of messaging tailored to statistical constructs like “disaffected Democrats with some college” or “married suburban men who drive S.U.V.s.” When it comes to politics, most people don’t want to be addressed as members of a demographic group looking for a payoff. They want to be addressed as Americans (emphasis added). To my mind, there is a lot of truth in this analysis, and particularly in the emphasized lines. Running campaigns "against Trump" doesn't provide an effective counter-argument to this kind of Republican Party appeal to "citizenship and solidarity." Incidentally, there are commentators on the more "progessive" side of the spectrum who seem to validate some of Buskirk's points. Consider, for instance, this opinion piece from The New York Times, which says that "Turning Affluent Suburbs Blue Isn’t Worth the Cost." The problem with the Trump/Republican Party approach, in my opinion, is that the Republicans seek to define a politics that appeals to people as "Americans" by trying to tell us that we are being mistreated by the world, and that our "citizenship and solidarity" is to be understood by way of fighting against "illegal immigrants," and former allies who are "cheating us at trade." This adversarial and almost totally negative approach does seem to be the basic Trump argument. I think that the argument is more appealing than many "progressives" believe. Since World War II, America has given itself credit for what it has assumed is its wonderful world leadership, what Buskirk calls a "failed policy of moral imperalism." Buskirk's characterization rings true to me. The statement of this wonderful "New World Order," as first announced by President H.W. George Bush, and as carried forward by Presidents Bill Clinton, George W. Bush, and Barack Obama, is not "paying off" for ordinary Americans. It may be "paying off" for the corporations, but not for the people. If we don't want a "Big Red Wave" swamping decency and our chance for a truly democratic (small-d) politics, then those on the "Blue" side of politics had better start articulating a vision of American "citizenship and solidarity" that is not based on anti-immigrant and resentful appeals to the worst in our human nature. We need to start appealing to the American people as a community, and not as subsets of that larger whole, but with a vision that unites us in a powerful and positive common purpose. Hey. It could be done!